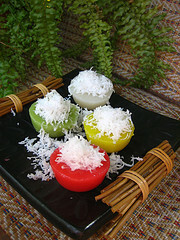 Kueh Lompang recipe made with dry rice flour, pandan leaves, alkali water, grated coconut. Great dessert for the month of Ramadan. Follow basic recipe of Thin Batter Using Dry Rice in this section. If quantity is not enough, add water to make up the 560 ml / 1 pt batter. Place wine cups in a tray. Add alkali water to batter. Add a few drops of colouring to whole quantity of batter. Or you may also divide batter into desired portions and add a different colour to each portion. Stir thoroughly and spoon batter into cups. Steam batter for 10-15 mins. till cooked. Check out these food steamers . Remove cups from tray. Cool cakes thoroughly before removing from cups. Spoon grated coconut on top of cake and serve. Use 2 tbsp chopped palm sugar (gula melaka) and 2 tbsp sugar for syrup but leave out colouring.